The last of the American Battleships to not have a home. U.S.S. Iowa will probably go to Stockton, California sometime in the near future. I say this because San Francisco just more or less said they do not and will never want the battleship in their fair city. Something on the order of having a warship and a symbol of the U.S. Navy in that city would go against the decidedly anti-war leaning city's nature. (Also the U.S. Navy's policy on homosexuals was sighted as well as a reason for the old battleship not to rest in San Francisco's docks). 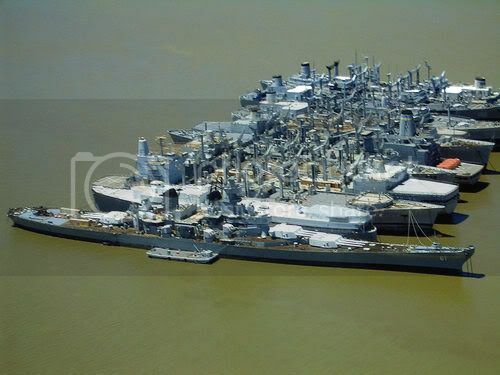 So it seems the Iowa will move inland a ways to Stockton from her current position in the "Mothball Fleet" in Suisun Bay. I just wonder now where U.S.S. Hornet will go once she is forced to leave Alameda? If Hornet has to go, why not send her along with Iowa and have a two-ship attraction at Stockton? That way visitors there do not have to travel far if they want to see a battleship and a carrier. I don't know why actually. The goal has been profit and to retain historical vessels. Clustering the ships sounds like a good idea, but I don't know if Stockton has enough space for two capital ships. It might look like a warship sitting in a corn field from a distance. Sacramento has shown some interest in Hornet. However, I think the sales pitch to San Francisco for the Hornet will be on the space exploration/recovery vessel aspect, to mask the "warship" view of this ship. Iowa can't be masked very well with nine huge guns on her deck. Other naval vessels in San Francisco include Liberty ships (which is not a warship) and a submarine that fired on P.O.W. carrying transports in the Pacific (and helped rescue survivors once that was discovered), which would reflect the horrors of war picture the city would like to show. Hornet is currently in a bad location as people don't generally go to Alameda. If it was in Oakland they might be more traffic, but San Francisco would be better for tourism. But Stockton or Sacramento....I don't know. Maybe once the Port Chicago Naval Weapons Station is closed they can dock her out there, practically across the bay from where Iowa rest now. What about running Iowa upto 30knots aim it at San Francisco and invite them to bend over. Hmmm, somehow I doubt it. Also wouldn't want to get the bow dirty. Actaully from where its sitting now, it could shell most of San Francisco with her main guns. Canis! Quick! Start making plans what you want to build in San Fransisco! Well, besides Mare Island, and a couple civilian shipyards, the majority of SF's naval facilities were built during WW2. My main West Coast bases are San Diego and San Pedro near LA. With Camp Kearny being the West Coast airship base, there's no need for the base in Mountain View. One possibility is a West Coast civilian airship port for flights to Hawaii, the Philippines, Australia, and Asia. Well this is about what old Iowa looks like now. Yes, it is a real shame about Pearl Harbor. Perhaps you might even see the outline of the Arizona if the resolution was better. The Belfast is visible in London as well. Hell, even my home and work are visible at maximum zoom... and an Orion taking off from the nearby Valkenburg airfield. Most of the ship in the Mothball fleet are merchantmen and other auxiliaries, but there are other rows with some of the retired missile cruisers and destroyers in them...also U.S.S. Inchon is (or perhaps was) out there with one of her sister ships. The "fleet" had a large number of Liberty and Victory ships until the early 1990s when most were sent to Japan....and set back as Hondas and Toyotas. U.S.S. Oriskany use to be out there, and then at Mare Island being scrapped before they towed her out to the Gulf of Mexico to become an artificial reef. And they're still waiting to sink her. Apparently they had to tow her from Pensacola where she was to be scuttled back to Texas to wait out the hurricane season since they were afraid that she would break loose in a storm. They are still finalizing the environmental studies before they sink her, but those were delayed when the guy in charge of the study was killed in an accident. The "fleet" had a large number of Liberty and Victory ships until the early 1990s when most were sent to Japan....and set back as Hondas and Toyotas. I don't know about revenge. Irony maybe. I still find it sad that U.S.S. Enterprise (CV-6) shared these ships fate to become Japanese cars or razor blades. Which brings up the question....what will become of the U.S.S. Enterprise (CVN-65) when she is retired somewhere around 2013. I thought U.S.S. Oriskany had already been sink. Hmmm, guess the reports of her fate have been misrepresented. Well, much depends on the political mood at the time she's retired, but they'll probably rip out her reactors and bury them somewhere for starters like they have the cruisers and subs that have been decommissioned. I think many of the nuclear cruisers are still around, stripped of superstructures and gutted. I'm sure there will be efforts to preserve her, but we're running out of viable locations now. We've got seven battleships on the East coast and in the Gulf, three carriers with possibly the Saratoga being added to the list, and there are still efforts to preserve the other Forrestals. The Norfolk area could probably support the Enterprise. They already have the Wisconsin and could probably use a carrier. I doubt you want those reactors in the ship should she be turned into a museum ship. You do not want the visitors to start glowing in the dark after a while should there be a problem with the reactors. At least you could leave with a souvenir! As for Oriskany, I got a look at her a coupla months ago while passing through Pensacola...pretty neat.